Citation: C N Trueman "Birmingham 1963"
In 1963, Birmingham became a focus for the civil rights movement. Birmingham, as a city, had made its mark on the civil rights movement for a number of years. Whether it was through the activities of Bull Connor or the bombed church which killed four school girls, many Americans would have known about Birmingham by 1963. Both SNCC and the NAACP were relatively inactive in Birmingham; so any civil rights campaign could be lead by SCLC without too much rivalry. Martin Luther King’s brother was also a pastor in the city so family connections helped the role of SCLC. Why was Birmingham so important? It was a KKK stronghold and King described it as America’s worst city for racism. City businessmen actually believed that racism held back the city but their voices were usually quiet. In recent years, the KKK had castrated an African American; pressured the city to ban a book from book stores as it contained pictures of black and white rabbits and wanted black music banned on radio stations. Any civil rights campaign in the city would almost certainly provoke trouble and gain the movement the national outcry that would result. Any serious trouble could lead to King’s desired policy – federal intervention. The head of the police was called “Bull” Connor – a man who believed in segregation. When the Freedom Riders had driven through Birmingham and were attacked, there were no police to assist them as Connor had given them the day off as it was Mother’s Day……..Birmingham and Connor would get the civil rights movement back on track after the problems it had experienced. Unlike Albany, the SCLC’s campaign in Birmingham was better planned but not without problems. In this sense King lead the movement rather than followed events. However, the local SCLC leader was not well liked among the African American community and demonstrations were poorly attended. Demonstrations were held in areas where African Americans lived – not conspicuously in the city centre. At one stage, African American onlookers were asked to join in to give the impression of mass commitment among the community of Birmingham. The lack of local involvement was the result of the imminent retirement of Bull Connor – many felt that things would improve once he was gone. King’s saving grace was Connor. He had a notorious temper and he saw what were in fact relatively low key protests as a threat to his ‘rule’ in Birmingham. He set police dogs on to the protesters and suddenly Birmingham got national attention. King was arrested for defying an injunction that denied his right to march. He was kept in solitary confinement and was refused the right to see his lawyer. Only the intervention of J F Kennedy got his release. To continue the campaign in Birmingham, King used children. Many adults still remained distanced from the protest. Though King did not want to use children, the film of Connor’s men using high pressure hoses and dogs on them was shown throughout USA. 500 youths were arrested and jailed. 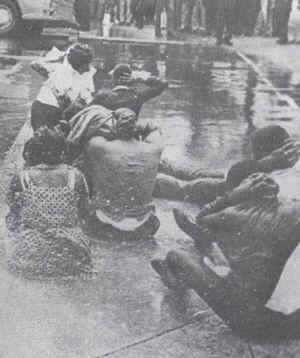 Birmingham appeared to be descending into chaos when King called for a one-day halt to the protests. This angered local civil rights leaders who called King “Mister S-H-I-T”. Why did King call for a halt? JF Kennedy had stated that what was happening in Birmingham was damaging America. King responded accordingly. However, many realised that it was Kennedy who had got King out of jail in Birmingham………Many local civil rights leaders felt that King was submitting to the power of white politicians – hence the “Uncle Tom” tag which followed King around in some quarters until his death in 1968. Stores were desegregated; opportunities for African Americans in jobs ‘improved’ (though from what to what?) and a biracial committee was set up to improve Birmingham’s troubled community. However, the talks were wrecked by the bombing of the house that belonged to King’s brother. King’s motel room was also bombed. These outrages provoked riots among the local African-American community. The white response? 1100 students who had attended the demonstrations were expelled for truancy from city schools and colleges. Only a federal court order got them reinstated. What was gained at Birmingham ? The SCLC had gauged Connor correctly. Had he behaved in an ‘Albany manner’, Birmingham would have been much less of a success. The scenes of police dogs attacking children and youths pushed Kennedy into greater action – civil rights legislation shortly followed. The media had once again shown America what life was like for African Americans in the South and probably provided the movement with its greatest boost. Extra money poured into the SCLC’s coffers as a result of this event.